The green drakes emerge from the rocks of Idaho's Henry's Fork of the Snake River every June, prompting a fly fishing exodus of minor note. These giant mayflies live in the river as larvae, then transform into a flying drake ready for the brief annual mating ritual. The timing is generally around June 20 but nature works in rhythms and cycles not on a time clock. When they begin their own redemptive passage the rainbow trout of the Henry's Fork feast on their bounty. These insects have power far beyond the strength of their wings. They have the power to move men. Through the snowy, cold winter nights doctors, lawyers, business executives and salesmen fiddle with their fly reels, rewind the thread on their rod ferules, and read sporting magazines to learn where and how to find the ultimate trout hole. Hours upon hours of dreaming and anticipation, planning and organizing all are dedicated to placing them hip deep in the Henry's Fork with large green bugs rising from its depths. For the most zealous, the green drake hatch is an annual event. For others it is a once in a lifetime event. For me and others like me who were lucky enough to be in a place and time gone by, the green drake hatch is a state of mind, a place once traveled that can never be reached again. 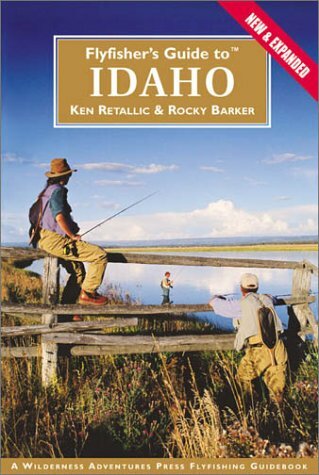 It's a place where Robert Redford had not yet made a movie about fly fishing that made the sport the latest fad. The North Fork fire had not loaded silt into Island Park Reservoir. The Bureau of Reclamation and Idaho Department of Fish and Game had not yet dumped thousands of tons of that silt into Last Chance and Harriman State Park through a bureaucratic foul-up of epic proportions. The fishing has held up but it has never reached its former glory. In this lost horizon, Bing Lempke still holds court sitting in a lawn chair outside his camper parked along the river at Last Chance. Bing was pipefitter who worked on nuclear reactors at the Idaho National Engineering Laboratory. He was a proud union man, a craftsman who knew his trade. Bing, who died in 1990, also was an artist. His medium was hooks, feathers, thread and hair. His tools were a vise, a bobbin, scissors and two gifted hands. He tied flies like Michelangelo painted ceilings, like Frank Lloyd Wright designed houses. His specialty was extended body flies, that replicated the banana-shaped abdomens of natural mayflies. His masterpiece was the green drake dun. On the end of the abdomen he always tied an peacock-hurl egg sac. This added detail would make the most educated trout give up his diploma. As the fly sat on the water it appeared like it would lift off and fly away. In June of 1986 I went to Last Chance to join the crowd awaiting the green drake. The drakes don't usually come off until about 10 a.m. so fishermen were moving about their campers finishing breakfast and waiting. Bing was where he was supposed to be, surrounded by an assorted group of friends and followers. Lawyers, celebrities and regular joes all were treated the same by Bing. But he didn't suffer fools gladly. He especially didn't like trendy types. He didn't care if they had money. It was pretensions he despised. One man, outfitted to the nines from his Orvis catalog was chased off with a sneer when he questioned Bing's use of an automatic fly reel, the kind that you wind up and take up the slack with a push of the button. As the hatching time grew near, Bing generously handed out handfuls of his flies and took me under his wing. We slipped into the water and waded to a designated spot near the West bank of the long shallow run. Dozens of others were making their way in as well and quickly the river was filled from bank to bank. It looked like the Oklahoma land rush only with the decorum that fly fishermen usually exhibit. Suddenly the hatch began and the river filled with dark emerging nymphs. Wings arose on the water like an armada of sailing ships. The trout went into a feeding frenzy, sucking down drakes faster than Montana loggers down beers after quitting time. Bing caught and released two in the opening minutes. The rod was nearly jerked from hand and my line started running across the current. Whatever-it-was, was big. I kept the pressure on as the fish steadily marched upstream in pulsing fashion. Then he turned and jumped nearly a foot out of the water. The rainbow was longer than 20 inches and another angler, mildly indignate about the interruption, presented an excited backdrop to my first view of the fish. "Don't horse him," Bing counseled as I struggled to keep the fish from tangling in the chaos of lines. After several reel-draining runs I brought the largest trout I had ever had on a fly rod to my net. Alas, at the last possible moment, the rainbow made one last desperate lunge and earned its freedom. Bing shook his head when I waded back into position 40 minutes after leaving his side. "He beat you didn't he?" he said without rancor. Yes he had. Yet I have relived that morning many times since and I have no thoughts of defeat nor sorrow. Norman McLean wrote in A River Runs Through It that a river "has so many things to say that it is hard to know what it says to each one of us." The Henry's Fork speaks to me in the twinkle of the eyes of Bing Lempke during the green drake hatch. His kindness, class and art haunt me each June when I slip into the river coated with green wings.